Git is a distributed version control system – a tool for tracking changes made to a set of files or coordinating work over time. It is often used by programmers to coordinate changes to software source code and the best part; it can be used to track any kind of content at all. It is specially designed to handle everything from small to large volume projects with utmost sped and efficiency. It’s extremely flexible meaning individuals can share work directly between their personal repositories and groups can coordinate their workflow through a central repository. It simply allows two developers sitting at two different locations to make and record changes independently, all without a central repository. 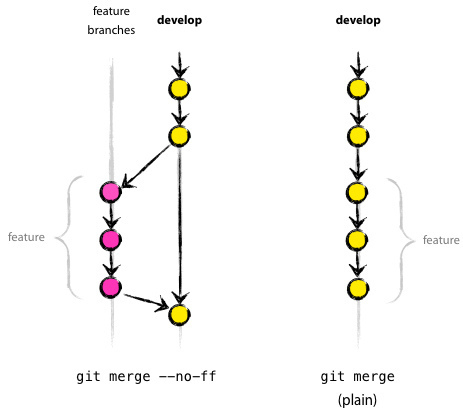 Merging is a common practice in Git used to integrate changes from one branch to another. Git merge is a command that commits changes to another location. It allows developers to take their independent lines of code created by the Git branch and integrate them into a single branch. This only changes the target branch while the history of the source branch remains. Git rebase is yet another command used basically for the same purpose except it does it quite differently. They both do the same thing – incorporate commits from one branch into another – but the difference lies in how they do it. We highlight some key distinguishing points comparing the two. Git merge is a command that unifies two or more commit history branches. A merge often unites just two branches, although Git supports merging of three, four, or more branches at the same time. Git merge is used by Git pull to incorporate changes from one branch to another or from another repository altogether. Merging must occur within a single repository meaning all the branches that need to merged, should be present in the same repository. Merge situations typically result from two or more users, trying to update common code. Most commonly, a user merges a branch into another branch in their local repository in a local environment. Git merge specifically integrates the contents of a source branch with a target branch. The target branch is changed, while the source branch remains. Git rebase is yet another alternative to merging used to integrate another branch with the branch where you’re currently working, except it keeps a linear commit history. 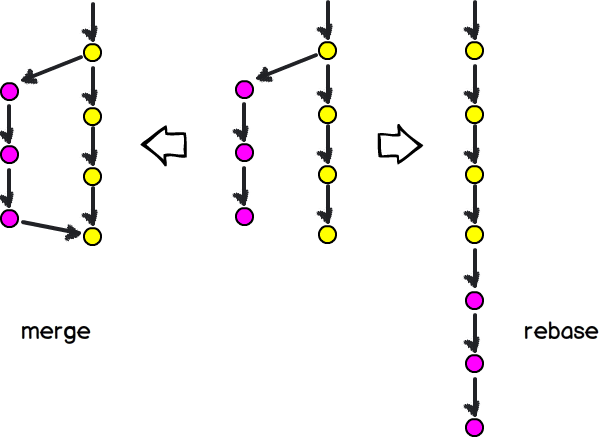 The purpose of Git rebase is to move a branch from one location to another. As commits are immutable, they cannot be moved, so this entails making new commits with the same changesets and metadata. A rebase fundamentally changes the notion of when and where a sequence of commits was developed, which results in some aspects of the development history being lost. This means the original commit on which the development was originally based will be changed. It effectively incorporates all the new commits in the master branch by rewriting the history. As a result, it creates new commits for each commit in the original branch. – Although, both merge and rebase are the most common ways to integrate changes in Git and they serve the same purpose – to combine multiple branches into one – the difference lies in how they achieve it. Git merge integrates the contents of a source branch with a target branch, while preserving the ancestry of each commit history, whereas Git rebase incorporates all the new commits in the master branch by rewriting the history by creating new commits for each commit in the source branch. – With Git merge, you first switch to the branch to be merged and then use the merge command to select a branch to merge in. Given that a branch points to a commit and that a commit is the granularity that you associate changes with, the merging command merges at the branch or commit level. Rebase, on the other hand, is a bit different. First you select a branch to rebase and then use the rebase command to select where to put it. – Merging creates a new commit that represents the merge between two branches. It integrates changes from different parallel lines of development (branches) together by creating a merge commit. The purpose is to join two or more branches together, including all the changes since the point of divergence into the current branch. Fast-forward is the default merge behavior in Git. Rebasing, on the other hand, alter individual commits by rewriting project history by creating new commits for each commit in the original branch, which in turn results in linear history with no divergent branches. – Git merge does not change history, while preserving the context of the branch meaning the existing branches are not changed in any way. It creates a new commit (unless it was a fast-forward merge), but the commits remain reachable from the branch. Git rebase, on the other hand, streamlines a potentially complex history. Commits are rewritten, old versions are forgotten, and the DAG of revisions is changed. Commits are no longer reachable with rebase meaning you are no longer able to rebase published branches. Well, in a nutshell, both merge and rebase are the two ways of integrating changes in Git, but they differ in how they do it. Merge is a one-step operation with one place to resolve conflicts and the commits that were reachable from the branch remain reachable. Rebase, on the other hand, reapplies each commit individually by rewriting history by creating new commits for each commit in the source branch. So, what was once reachable is no longer reachable. A rebase fundamentally changes the notion of when and where a sequence of commits was developed. Sagar Khillar. "Difference Between Git Rebase and Merge." DifferenceBetween.net. 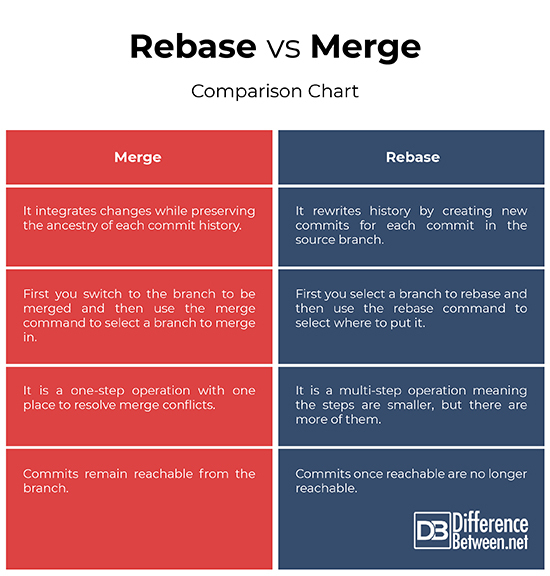 March 8, 2019 < http://www.differencebetween.net/technology/difference-between-git-rebase-and-merge/ >.